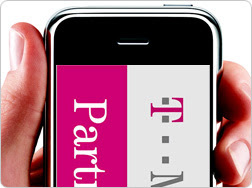 Apple Inc. picked Deutsche Telekom AG's T-Mobile to sell the iPhone in Germany, Europe's largest mobile-phone market. The 8-gigabyte handset will go on sale in Germany ONLY on November 9 for 399 euros ($557) including tax, even more expensive than the UK price of 269 pounds ($536). Apple and T-Mobile didn't give financial details of the partnership, such as how revenue will be shared.